Few true winners emerged from a contentious legislative session that saw lawmakers slashing spending, cutting tax credits and struggling to find new revenue amid a record $1.3 billion budget shortfall. But in the end, after the Legislature approved a $6.8 billion budget Friday, it was clear that some groups came out ahead more than others. Oklahoma’s 25 colleges and universities will receive some of the deepest hits in the new budget, which takes effect July 1. The State Regents for Higher Education will see a cut of $153.4 million, or nearly 16 percent, compared to their original funding for this year. Preston Doerflinger, secretary of finance, administration and information technology, said higher education was among groups that have a “superior financial position” allowing them to absorb cuts better than other core-service agencies. But the reduction will challenge higher education leaders, who now have to examine whether layoffs, tuition increases and curtailing or ending academic programs are required. 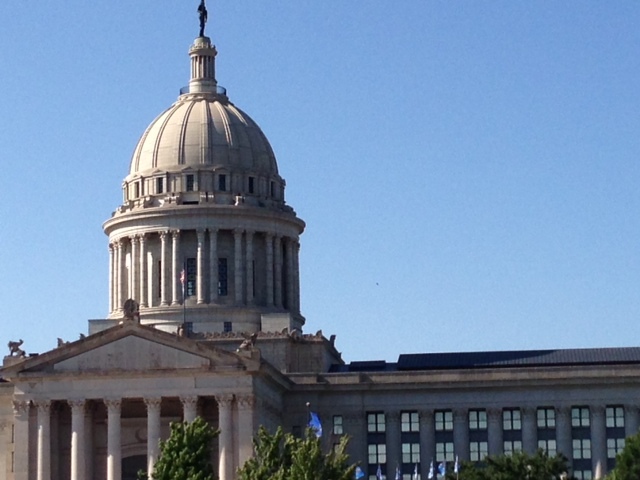 Thousands of Oklahoma households will lose a key benefit as part of the Legislature’s move to eliminate or cap tax credits. Lawmakers removed the refundable portion of the state’s earned income tax credit, saving the state about $29 million next year. Critics said the cut unnecessarily burdens about 200,000 low-income families who will lose an average $150 a year. Despite the revenue-raising and cost-cutting moves, lawmakers were only able to close the $1.3 billion shortfall through many one-time funding measures. This includes taking out $200 million in transportation bonds and tapping $144 million from the state’s Rainy Day Fund. Legislative leaders acknowledged that the state’s structural budget deficit will remain and likely prompt more tough budget decisions next year. The minority party again lost fights to pass proposals to expand the state’s Medicaid program, which would bring in hundreds of millions of federal dollars, and to roll back the most recent cut in the top income tax rate. The 30-member House Democratic caucus tried to force a vote on the Medicaid plan by holding up passage of a proposed $1.50-per-pack cigarette tax hike. That effort fell flat. Both the cigarette tax and Medicaid expansion failed. While almost every state agency saw significant cuts, common education took a relatively small hit percentage-wise. Superintendent of Public Instruction Joy Hofmeister described this as “a best-case scenario” for Oklahoma’s schoolchildren. Hundreds of educators and supporters rallied at the Capitol shortly after the budget was released, calling for a funding boost and teacher pay raises. In late March, the Oklahoma Health Care Authority issued a dire warning that it was preparing to cut Medicaid provider rates by 25 percent because of the budget squeeze. This would have dealt a blow to hospitals, physicians, pharmacies and nursing homes, possibly leading to closures. Still, in health advocates’ view, there were huge setbacks. Medicaid expansion and a Medicaid rebalancing plan, either of which would have brought in hundreds of millions of federal dollars, failed to win approval. Oklahoma has one of the highest incarceration rates in the country. But a package of bills signed into law by Gov. Mary Fallin seeks to reduce the number of felons in the state’s prison system. This includes reducing minimum mandatory punishments for drug offenders, expanding the use of drug courts and community sentences and giving prosecutors more discretion to file misdemeanor instead of felony charges for certain crimes. Another bill sent to the governor would give judges the ability to waive court fines, costs and fees in criminal cases. However, other legislative actions will double court fees in traffic, misdemeanor, felony and juvenile cases. Lawmakers passed bills that limit tax credits for the oil, gas and coal industries. The biggest was a measure to save about $120 million next year by capping the tax credit for at-risk oil and gas wells at $12.5 million per year. In contrast, the wind industry survived attempts to cut its sizable incentives. One proposal would have saved the state more than $300 million over a decade by phasing out the wind energy tax credit at the end of 2017 instead of the end of 2020. Several top lawmakers said they plan to reexamine the wind energy incentives in the coming year. A number of retailers stand to come out ahead – or at least avoid possible losses. Lawmakers rejected a proposal to increase the state’s cigarette tax by $1.50 per pack. Tobacco lobbyists, convenience stores and wholesalers argued the tax would drive people out of the state in search of cheaper prices. The Legislature also agreed to allow voters to decide on alcohol sales changes, which would remove many restrictions on the sale of wine and high-point beer and expand offerings at grocery and other stores. For brick-and-mortar retailers, there was a mixed result. A push to require online retailers to collect sales tax resulted in a weaker bill that was signed by the governor. That bill asks out-of-state companies to charge sales tax to an Oklahoma buyer. It also requires online sellers to send yearly notices to customers to remind them of the requirement to pay sales tax to the state. Republican leaders proudly announced at the close of the session that they had bridged the budget gap without any tax increase. This came after proposals to raise taxes on cigarettes, alcohol and gasoline were defeated in the session’s closing weeks. Efforts to broaden or increase the state’s sales tax also failed to gain legislative support. That could change in November if voters decide the Legislature hasn’t done enough to support education and approve a penny sales-tax hike that would boost teacher pay and help support higher education.